This working capital needs calculator can be used by a business to estimate the cash needed to fund operating assets such as accounts receivable and inventory after allowing for amounts funded by suppliers accounts payable and other current liabilities. The concept of working capital and its calculation is more fully discussed in our posts on how to calculate working capital requirements and working capital finance strategy. By entering details relating to the revenue, margins and the assumptions to be used in the business model the working capital needs calculator can be used to estimate the following. The cash needed to fund working capital. The working capital needs as a percentage of revenue. The working capital needs calculator is used as follows. Enter the estimated revenue for the year. Enter the gross margin percentage. The gross margin percentage is the ratio of the gross margin to the revenue of the business and is more fully discussed in our How to calculate gross margin percentage post. Enter the expenses percentage. Expenses for this purpose refer to operating expenses, finance costs and income tax expenses. Cost of sales and depreciation related expenses should be excluded from the calculation. Enter the accounts receivable days. The accounts receivable days is the average number of days credit given by the business to customers. Enter the inventory days. The inventory days is number of days cost of sales held as inventory by the busienss. Enter the accounts payable days. The accounts payable days is the average number of days credit given to the business by trade suppliers. Enter the other liabilities days. The other liabilities days is the average number of days credit given to the business in respect of expenses (excluding cost of sales and depreciation related expenses). 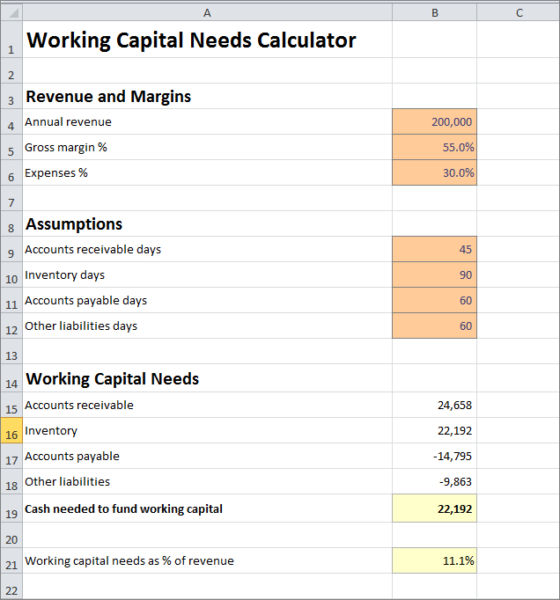 The working capital needs calculator estimates the cash needed to fund working capital analysed by accounts receivable, inventory, accounts payable, and other liabilities. Finally the calculator shows the working capital needs as a percentage of the revenue of the business to allow quick estimates to be made for varying amounts of revenue. The working capital needs calculator is available for download in Excel format by following the link below. Users use this net working capital needs calculator at their own risk. We make no warranty or representation as to its accuracy and we are covered by the terms of our legal disclaimer, which you are deemed to have read. 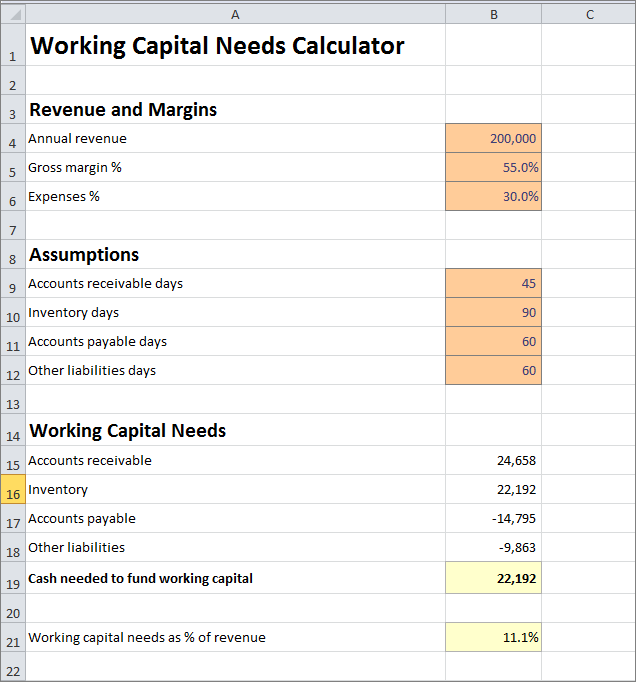 This is an example of a calculator that you might use when estimating how to calculate net working capital needs for a business financial projection. It is purely illustrative of an Excel working capital needs spreadsheet. This is not intended to reflect general standards or targets for any particular company or sector. If you do spot a mistake in the small business working capital needs calculator, please let us know and we will try to fix it.